There is a wonderful tradition of drama and entertainment in Myshall. Here you will find one of the most talented and innovative populations in the country. There is documentary evidence going back as far as 1908 to show that plays and concerts were popular pastimes in the area. The 20th century is dotted with great productions -"Knocknagow" in the 1940's, many of J.B. Keane's plays throughout the 1950's and 1960's when being a member of Myshall Drama Society was coveted by parishioners and those in surrounding areas alike. The pre-television days were filled with local talent, song & story, concerts and céilí. Plays and converts proved to be great fundraising events, e.g. 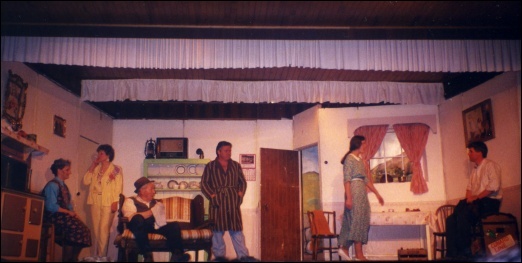 Myshall Drama's last big production - J.B. Keane's "The Field" was staged to packed houses especially to raise funds for the re-roofing of Drumphea Church and in 1996, they won their way to an All-Ireland Final with "The Year Of The Hiker".